Most junior resource investors know uranium, and many got in on the action when NexGen Energy and Fission Uranium made their discoveries in the Athabasca Basin of Saskatchewan, the region with the highest grades of uranium in the world. Smart, or lucky, shareholders of NXE enjoyed a cumulative share price rise of around 430% between 2014 and 2016, while Fission Energy - famous for its Patterson Lake South property that yielded the open-pittable Triple R deposit - jumped from 91 cents in November 2013 to $1.62 a share in April 2014, for a gain of 78%. When nuclear power goes wrong, the fallout is catastrophic. Nuclear meltdowns like Chernobyl in Russia, Three Mile Island in the US, and Fukushima in Japan are burned into the collective consciousness and serve as constant reminders of the dangers of nuclear power that drive the anti-nuke movement. Thorium is named after Thor, the Norse god of thunder. It was first discovered in 1815 by Jöns Jakob Berzelius, a Swedish chemist, but a few years later it was determined that the mineral was actually yttrium phosphate. 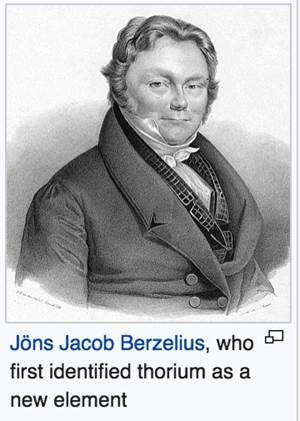 In 1828 Berzelius was given a sample of a black mineral found on an island off the coast of Norway by Hans Esmark, a Norwegian mineralogist. The mineral contained several known elements including lead, tin, iron, manganese and uranium, but 60% was an unknown substance that was subsequently named thorite. Thorium was first isolated by mixing thorium oxide with carbon, creating thorium chloride. When reacted with potassium, the result was thorium and potassium chloride, according to Chemicool. It took another 70 years for scientists to realize that thorium was radioactive. The discovery was made by Gerhard Schmidt, a German chemist, and Marie Cure, a Polish physicist, who are often credited with its discovery. However it is thought to be rare because thorium is normally found as minor constituents of metals. Interestingly though, natural thorium occurs as almost pure 232Th, the most stable thorium isotope, which has a half-life comparable to the age of the universe (14 billion years), and whose radioactive decay is the largest contributor to the Earth’s internal heat. Right now it’s estimated the planet still has about 85% of the thorium present when the Earth was formed. Scientists at Los Alamos National Laboratory - where the first nuclear weapons were designed as part of the Manhattan Project - think that thorium was created in the cores of supernovae (the last stages of a star’s life), then scattered across the universe when the stars exploded. Trace elements are found in rocks, soil, water, plants and animals, with higher concentrations contained within thorite, thorianite, monazite, allanite, and zircon. The element is mined mostly in Australia, Brazil and India. The rare earth mineral monazite contains between 6 and 12% thorium phosphate. Attention then turned to the use of thorium in nuclear energy. During the Cold War the US looked at using 232Th to create 233U - which was being investigated as both a reactor fuel and to build nuclear bombs. But the US Military rejected a bomb built with 233U because it did not have “technical advantages” over uranium-plutonium bombs and especially since it it is difficult to produce pure 233U states a 1966 technical report. With the United States in the early stages of an arms race against the former Soviet Union to develop a nuclear arsenal, it was easy to see which element would win out. While thorium was used in a later version of America’s first civilian nuclear power plant - headed up by Hyman Rickover, the US admiral responsible for creating the world’s first nuclear-powered submarine - it would take a back seat to uranium as the primary fuel for nuclear reactors. Thorium nuclear reactors were developed at the Oak Ridge National Laboratory to support nuclear-powered long-range bombers, but the program was scrapped in 1961 in favor of other technologies according to a 2009 NASA paper. This is because the liquid fluoride thorium reactors did not produce as much plutonium, needed for developing nuclear weapons, as uranium-powered reactors. Thorium is three to four times more abundant than uranium. There is estimated to be enough thorium on the planet to last 10,000 years. Thorium is more easily extracted than uranium. 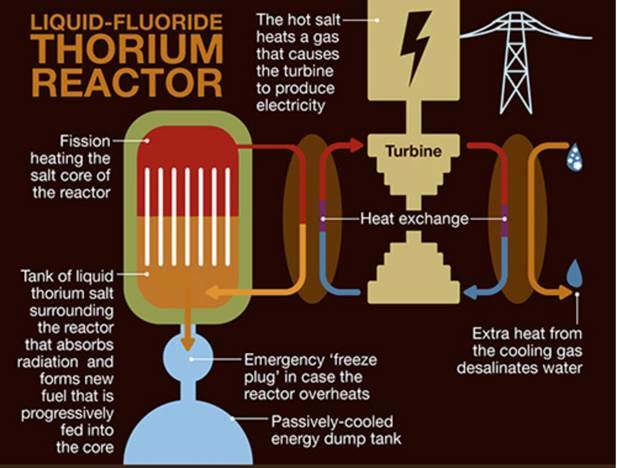 Liquid fluoride thorium reactors (LFTR) - a type of molten salt reactor - have very little waste compared with reactors powered by uranium. It is more efficient. One tonne of thorium delivers the same amount of energy as 250 tonnes of uranium. LFTRs run at atmospheric pressure instead of 150 to 160 times atmospheric pressure currently needed for water cooled reactors. Thorium is less radioactive than uranium. The 2011 Fukushima disaster in Japan soured the world on nuclear, and started scientists looking more closely at thorium as a “greener” alternative. While conventional nuclear plants are only able to extract 3-5% of the energy in uranium fuel rods, in molten salt reactors favored by thorium proponents, nearly all the fuel is consumed. Where radioactive waste from uranium-based reactors lasts up to 10,000 years, residues from the thorium reaction will become inert within 500. Lastly, because plutonium is not created as a waste product in a thorium reactor, it cannot be separated from the waste and used to make nuclear weapons. Although, the World Nuclear Association points out that the United States made about two tonnes of U-233 during the Cold War and detonated a nuclear weapon containing U-233. The explosive yield though was less than expected, just 22 kilotons. In 1998 India detonated a small nuclear device from U-233. India’s thorium program is well advanced. The country envisions meeting 30% of its electricity demands through thorium-based reactors by 2050. With large quantities of thorium and little uranium, India wants to use thorium for large-scale energy production. It plans to construct and commission a fleet of 500 sodium-cooled fast reactors - which burn spent uranium and plutonium - in order to breed plutonium to be used in its advanced heavy water reactors that employ thorium as the nuclear fuel. A prototype of the 500-megawatt fast breeder reactor (FBR) in Kalpakkam, India was supposed to be finished in late 2017 but has been put off to later this year. Indonesia, which has a large amount of thorium contained within monazite, signed an agreement three years ago with US company ThorCon Power, to develop molten salt reactors. A 1,000-megawatt thorium-based reactor would be used for base-load power and produce 5 gigawatts a year. The country wants around 20% of its energy mix to come from thorium molten salt reactors by 2050. If there hadn’t been an urgent need to develop nuclear weapons for the Cold War, there’s a reasonably good chance that thorium rather than uranium would have become the nuclear fuel of choice. The ability of uranium to kickstart the nuclear reaction makes it one of the most strategically important minerals on Earth. If the world was running out of uranium, thorium demand, and the technology to make molten salt reactors, would probably be much farther advanced than it currently is. But we are not running out of uranium. According to the World Nuclear Association (WNA), in 2017, world uranium production totalled 59,531 tonnes, which satisfied 92% of world demand. 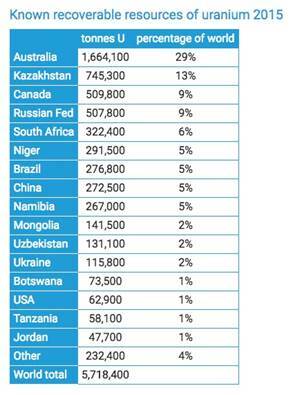 The top producers are Kazakhstan, Canada and Australia. Total known, recoverable uranium resources as of 2015 were 5.718 million tonnes. Thorium and its potential for resource exploration is on my radar screen.